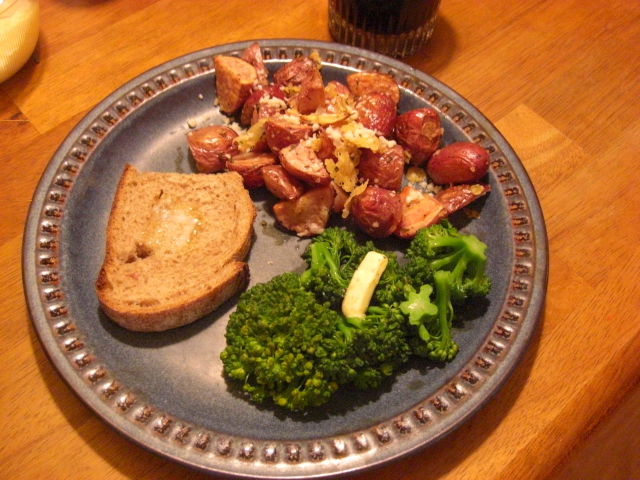 The steamed peas and broccoli/broccolini were terrific. 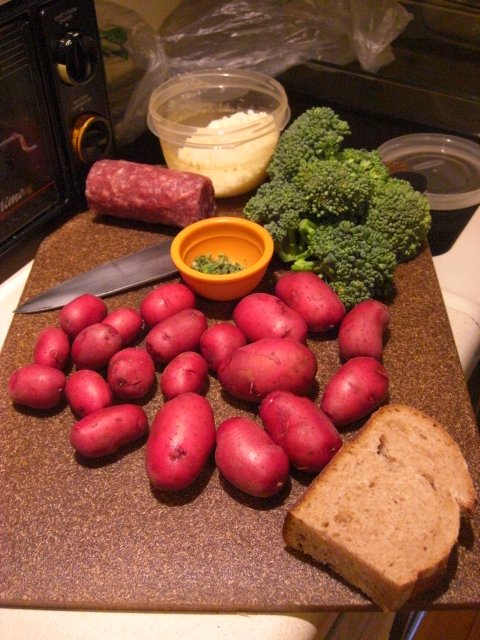 Nothing fancy – I just steamed them in a basket for a few minutes until they looked really green and were tender. A little butter, salt, and pepper were all they needed. The catfish fillets from Maple Leaf Farm via Farmers’ Fresh online store were really good. 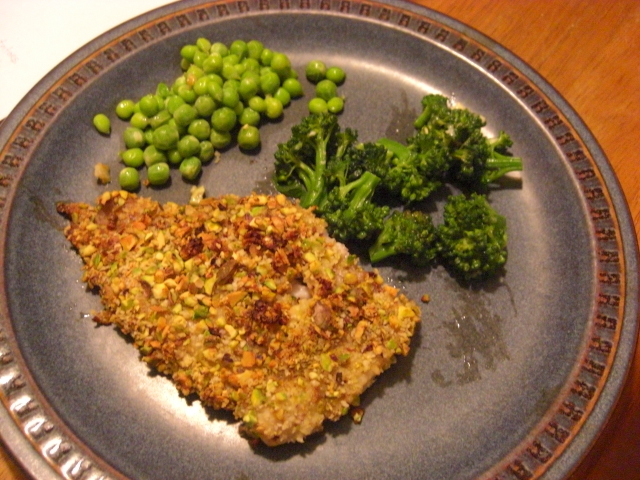 The recipe I used called for a coating of olive oil, Dijon mustard, and honey and a pistachio-bread crumb crust. I think all of this overwhelmed the catfish, though, and next time I’ll follow the same recipe but leave off the pistachios and mustard and maybe the honey. Stick with bread crumbs and olive oil and focus on the fish instead. Saturday I ate myself silly at the Bloggers’ Brunch at Park 75. But since I forgot to bring Chris any chocolate, I had to make it up to him with the burgers he’s been craving. I love making burgers with the ground beef from Farmers’ Fresh. 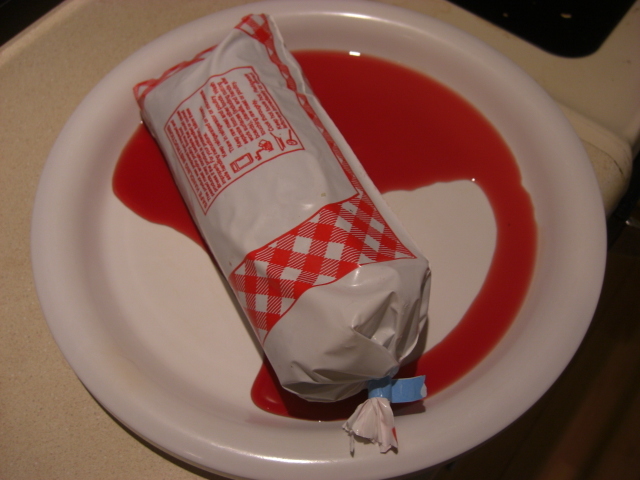 It has a lot of flavor, and I’m comfortable stopping at barely medium-rare. But here’s a handy tip. 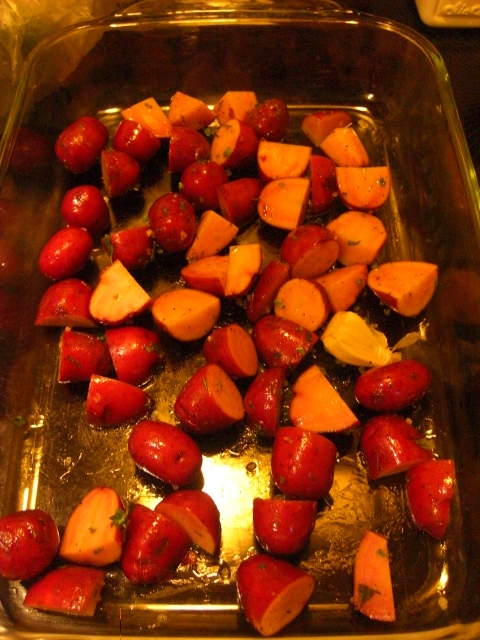 I’ve tried roasted potatoes like this before but these were the best. I think it’s because I dried them after washing and before cutting up. I read somewhere that that was important, and it makes sense. If you put wet potatoes in an oven, they’re going to steam not roast, right? 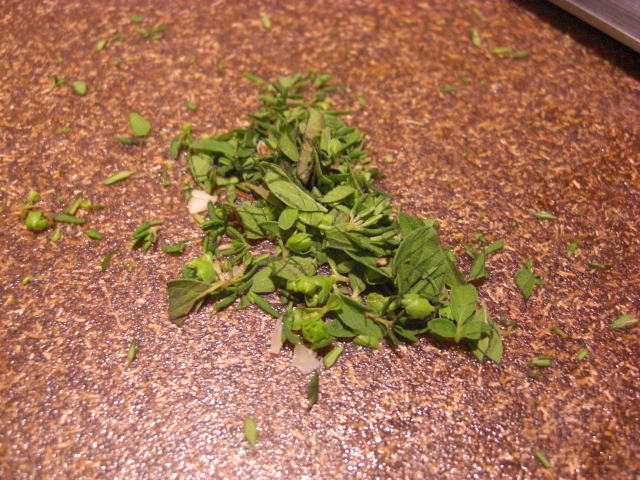 Then I cut the potatoes up, tossed them in olive oil, oregano and thyme from Lucy’s garden, and some salt and pepper. I roasted these for about 25 minutes at 400 degrees. About half-way through, I added some grated Romano. I was worried that it would burn, but what it did instead was sink to the bottom of the dish and form these incredible cracker things. Soooo good. I had planned to slice some salami to include with this supper, but then I remembered the rule: people who eat vegetarian suppers get egg custard for dessert. 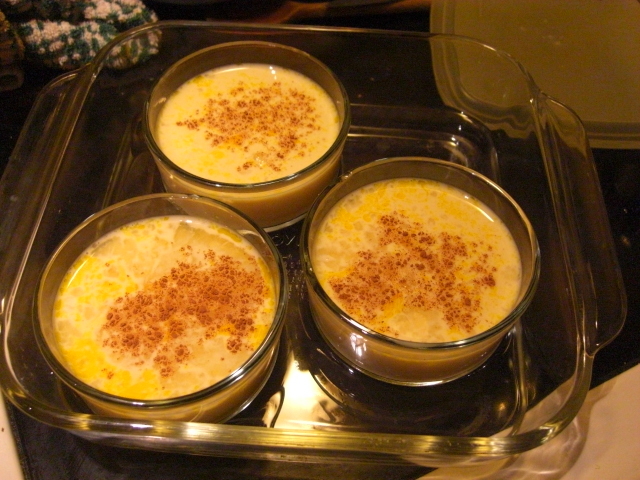 Egg custard is yummier than salami. I wanted to eat up the rest of the beef but didn’t want to make burgers again. Then I found a taco kit in the pantry. I used the tortillas and the taco seasoning. (I love that dry taste in taco seasoning!) I tossed out the cheese sauce whose primary ingredient was soybean oil. Then I cooked the beef and some red onions along with the seasoning. 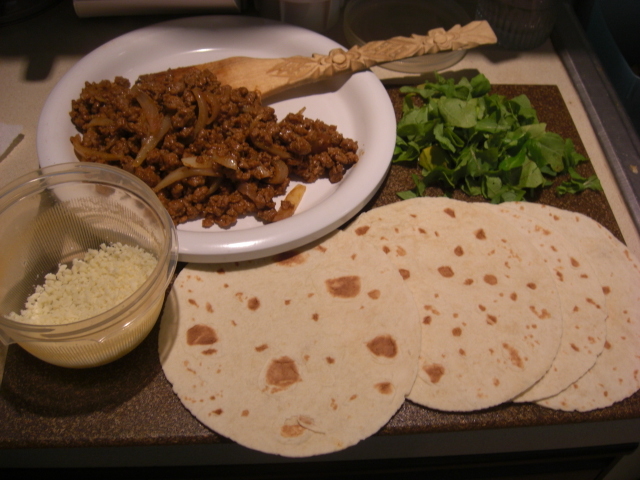 I didn’t have any other traditional taco fixings, so we ended up with beef, arugula, and Romano tacos. And they were surprisingly delicious. 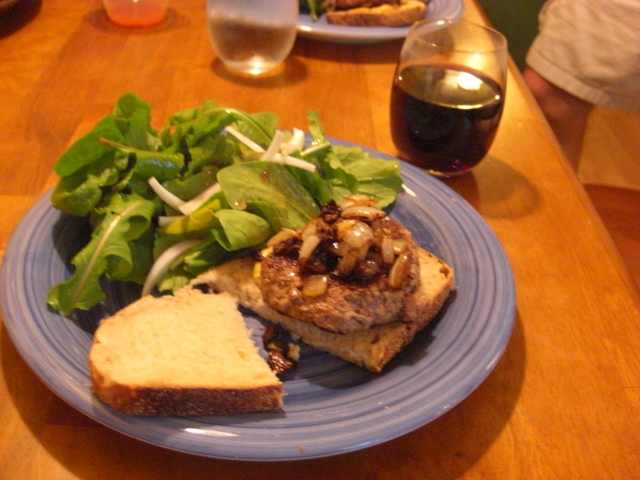 Everything looks smashing – your burger with the salad…man that makes me hungry. I am doing burgers tonight too with the Farmer’s Fresh ground beef. I’m attempting to make my own hamburger buns, we will see how that turns out. I’ve got the dough rising right now and it seems….hard. Every new attempt is a learning experience!